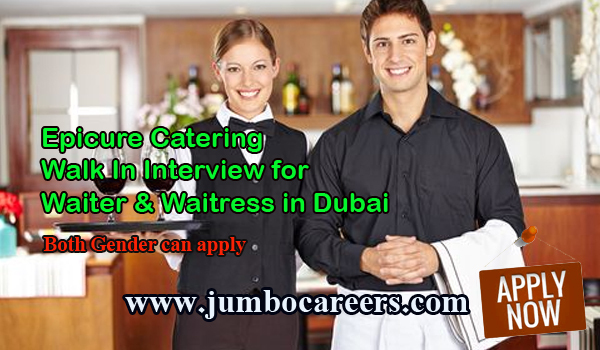 Epicure Catering Service LLC Dubai is conducting latest walk in interview for Vacant Position Waiter & Waitress. People who were unable to attend interview may mail their resume. About the Company : As a part of the lifestyle and technology conglomerate, Pragma Group, the success of Epicure Catering is backed by the expertise of its 120 plus strong staff, including International Chefs and resident nutritionists, a state-of-the-art kitchen, and strict adherence to HACCP and Dubai Municipality guidelines . Based out of the 12,000 sq ft location in Al Quoz, Dubai, we offer our services to a variety of high-end clients and social affairs, including weddings, cocktail receptions, gala dinners, black tie events and cosy family get together. Location Epicure Catering Services, Warehouse # 26 Street 22, Al Quoz Industrial Area -3, Dubai.